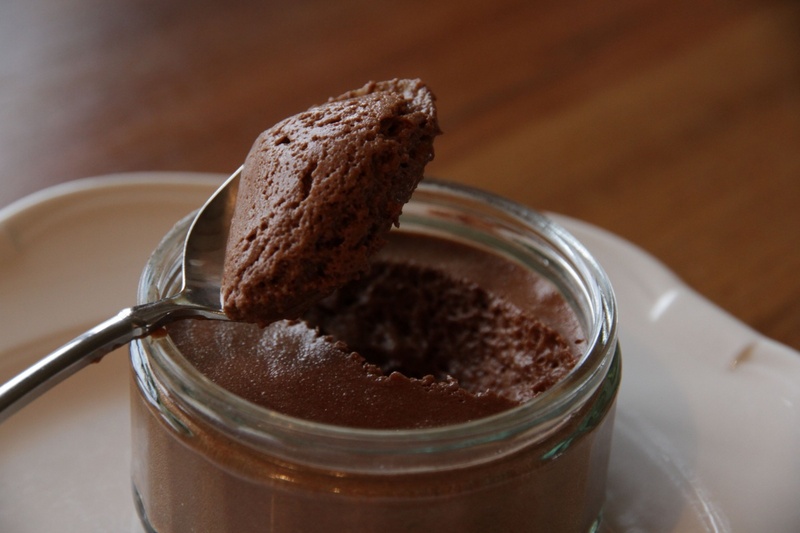 This is easily the best chocolate mousse I have ever eaten. You won’t see any actual caramel in the mousse but the deep, rich flavor is there. It is quick to put together and is worth every single calorie. I adapted this recipe very slightly from David Lebovitz’s recipe for Salted Butter Caramel-Chocolate Mousse from his book My Paris Kitchen: Recipes and Stories, which I don’t even own (yet! Christmas is just around the corner). I found the recipe here. This mousse contains raw eggs so if this is a concern for you, look for pasteurized eggs at the store. Use the best butter, cream, chocolate and eggs you can. I used the freshest eggs from our own chickens and Lindt Mild 70% Cocoa for the chocolate. Mise en place (French for „putting in place“ – how appropriate for our French recipe!) is especially important when making this mousse because you have to work quickly when making caramel and never leave the stove while it is cooking. In other words, it’s important to have everything you need measured out and within easy reach. Also have your kitchen utensils at the ready so there’s no frantic grabbing at a critical moment. I use the strainer in case there are any hard caramel bits that didn’t dissolve. Salted Caramel Chocolate Mousse should be served on its own, with nothing to distract you from the flavor explosion in your mouth. When I served this Salted Caramel Chocolate Mousse to my Book Club, it got pretty quiet in the room as everyone savored their mousse – and there’s not much that’ll leave us speechless! Mise en place: put a mesh strainer over a large bowl and place the fleur de sel and finely chopped chocolate nearby. Measure out the butter and cream and place them near the stove. Have a silicone spatula, whisk and cooking spoon ready. Spread the sugar over the bottom of a wide, heavy-bottomed saucepan. Heat the sugar over medium heat. As it liquifies, stir very gently with a silicone spatula to ensure it caramelizes evenly. Watch for it to start to smoke and when tiny black bits start to form, remove from the heat and quickly whisk in the butter until melted. Gradually whisk in the cream and stir until the caramel has dissolved completely. Pour the mixture through the strainer into the large bowl. Remove the strainer and stir in the fleur de sel. Add the chocolate and stir the mixture until the chocolate is completely melted and smooth. Let cool to room temperature. When the chocolate mixture is no longer warm, whisk in the egg yolks. In a separate bowl, beat the egg whites until stiff. Fold ⅓ of the beaten egg whites into the chocolate mixture then fold in the remaining egg whites until no white streaks remain. Transfer mousse to ramekins, serving glasses or a serving bowl and chill for at least 8 hours. Slightly adapted from David Lebovitz's recipe for Salted Butter Caramel-Chocolate Mousse found on epicurious.